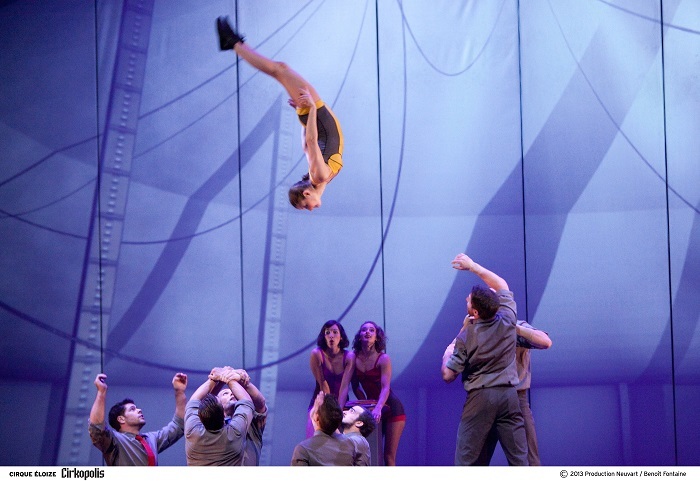 Canadian troupe Cirque Eloize has touched down in London for ten days ahead of a UK tour. One of the forerunners of Cirque Nouveau, they’ve been blending high level circus with narrative and storytelling since 1993. The last show I saw at the Peacock theatre was last September’s Sequence 8 by Les 7 Doigts De La Mains. For Sadler’s Wells to programme Cirque Eloize provides further proof that they are establishing themselves as one of the premiere venues in the capital for this kind of world class modern circus. There are quite a few similarities between the two shows. Both feature a strong ensemble cast of multidisciplinary performers taking turns for solo slots and big choreographed set pieces. They even share a number of tableaux that are almost interchangeable. A moment where one performer walks across the others around and up onto a Chinese Pole is a striking case of déjà vu. While Sequence 8 went for non-linear minimalism, Cirkopolis tells of a dark grey world filled with rules and systems that gives way to colour; balloons, a red rose and other fairly clichéd objects let us know that we are progressing to greater humanity. The narrative is developed primarily through projections that take you into and through a fantastical future city. Let me be clear: this is a show of extraordinary talent and versatile performers and, at its best, it exhibits these skills at a phenomenally high level. The straps piece by Jérôme Sordillon is a standout moment in the show and one of the points I felt a real connection as a performer myself. The German wheel by Frédéric Lemieux-Cormier is also a pure moment of a performer owning their apparatus. The Cyr wheel is used to create a eye-opening image with performer Léa Toran Jenner spinning inside it wearing a red dress that floats around her. However, the overall show somehow lacks a raw honesty that would elevate it to something sublime. While I’m sure all of the cast are pushing themselves, it all looks too easy – at no point do you get that heart in your throat, the “will they make it, will they land safely?” feeling. In fact, you’re left very sure they will and everything feels somehow too easy. While Cirkopolis has the occasional solo spots, the vast majority of the routines are based around group work. This can work well at times. An army of ten people juggling clubs in complex positions is a wonderful spectacle in its sheer totalitarianism. At other times you wish they would have given more time for individuals to explore and develop their particular speciality. There are also some moments that frankly don’t hit the mark: a point on the double trapeze never gets beyond the rudimentary. It is also rather uncertain why the three female performers end up in a kind of futuristic swimming costume at the end of the show when all the men remain in shirts and trousers. Just why? While the show draws influence from films like Metropolis or Brazil, Cirkopolis is a simple homage to their overarching message without any additional complexity or comment. The vibe is often dark but by no means edgy or challenging in the way shows like Limbo, Bianco or La Soiree have managed recently. This is ultimately Canadian circus, that while it downplays it to a certain extent, still likes its jazz hands – and is a little too politically correct in its delivery. There is clearly an amazing display of skill here and so much is working, but it fails to deliver enough palpable heart-wrenching moments it should. Cirque Eloize’s Cirkopolis continues at Sadler’s Wells’ Peacock Theatre until 28 February. More information can be found on the Sadler’s Wells website.